Kadhi-chawal is one of the most popular meals in India. 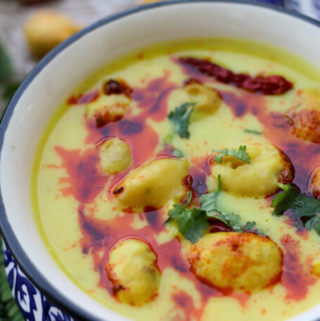 Kadhi is a yogurt based curry with gram flour dumplings. It is made by cooking a yogurt and gram flour (besan) mix with whole spices. The pakoras are deep fried gram flour dumplings. What sets them apart from regular pakoras is that they are very soft and when cooked in the curry they absorb the curry like a sponge. In our home, kadhi and kadhi pakora are the same. If I ever make kadhi without the pakora, it will not be counted at all! A kadhi is not a kadhi until it has pakoras in it. And it has to be paired with rice and nothing else will do. Kadhi and rice, the ultimate comfort food. Kadhi recipe can be found across all cuisines in India. Each region has their own variety of this simple recipe. We make kadhi without any onion or garlic and just a smooth base of yogurt; in Punjabi kadhi, the curry also has onions; in Gujarati kadhi, a little jaggery is added to add sweetness; Bohri kadhi, also called khata, is much more thicker in consistency and the pakoras are made with onions and other spices; and in Sindhi kadhi the base curry is not made of yogurt but tamarind and it also has lots of veggies in the curry. We also make kadhi with just tomatoes, which is like a thick and spicy tomato soup. I think the simplest form of kadhi that I have come across is this one. It’s got just two main ingredients (yogurt and gram flour), minimal spices, and very soft plain pakoras (gram flour dumplings). Kadhi Chawal has been a comfort food for me ever since childhood. Since we originally belong to U.P., I would say this recipe is closer to U.P. kadhi. I hope you like this recipe. 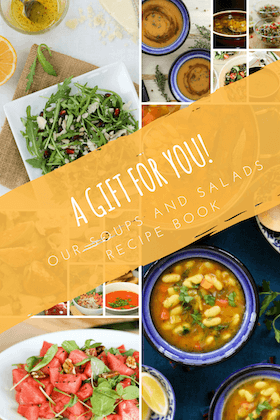 It will really encourage me to improve myself if you can take a moment to rate the recipe and/or leave your thoughts after the post. 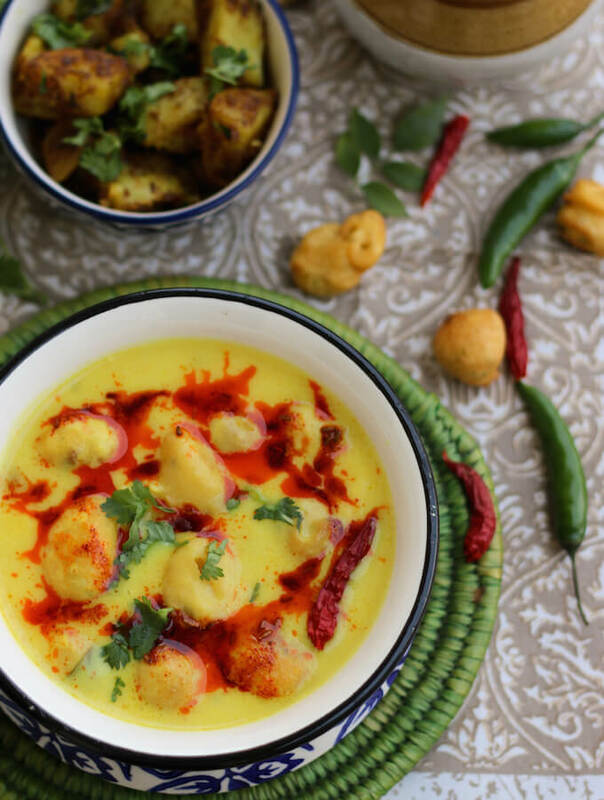 This is the simplest of kadhi recipe — A mildly spiced pakora curry made with gram flour and yogurt. Pair it with a bowl of rice and a plain potato fry for a warm comforting meal. Whisk 3 tbsp gram flour with ~½ cup water to make a thick paste. Whisk it for about 5-7 minutes by hand so that the paste is nice and fluffy (My mom says that whisk is so much that the quantity of the paste almost doubles up by the air that you are incorporating in it). Heat oil for frying in a deep wok or Kadhai. Put spoonfuls of the gram flour paste into hot oil and deep fry till lightly brown. Remove on an absorbent kitchen towel. Keep aside. Whisk together the yogurt, 1 tbsp gram flour, red chilli powder, turmeric powder and 3 cups water using a blender. (I use the same bowl as the one for making the pakora paste, so that any remaining batter is also used). Heat 1 tsp ghee in the deep pan. Add hing, curry leaves and dried red chillies. Once the seeds crackle, add the yogurt mixture and bring to a boil, stirring continuously. Add salt, lower the heat and simmer for 20 minutes, stirring occasionally. Add the pakoras and simmer for another 5 minutes. Heat 2 tsp ghee in a small pan (like a tadka pan). Add cumin seeds. When the seeds crackle, add the kashmiri red chilli powder. Remove the kadhi in the serving bowl. Add the tempering on top. I love the deep red colour of the tempering on the yellow kadhi. Keep the curd outside refrigerator overnight for it go sour. Else you can also add lime juice after the Kadhi is cooked. I use Kashmiri red chilli powder which doesn’t have too much heat but adds natural colour. To make the kadhi spicier, you should use regular red chilli powder. good one…tried it today and it came out just perfect! Hi Ashima! Thanks for the recipe. I’m wondering if I can substitute the yogurt with greek yogurt? Yes, you can use Greek yogurt in this recipe. Kadhi tastes good when the yogurt is a little sour, so if you can keep the yogurt out of the refrigerator for a few hours before making the kadhi it will be better.